Cargo ships, together with transports, are the ultimate reason why navies exist. They are the least expensive way to transport goods over long distances, though not the fastest. A typical cargo ship of the late 1930s could carry a few thousand tons of goods at a cruising speed of perhaps 10 knots, with a fuel consumption of around 0.1 ton per nautical mile. Some of the older cargo ships still used coal instead of fuel oil. Careful management of cargo shipping was vital to ensuring adequate logistical support for operations in the Pacific. A ship has only so much space for its cargo. Gross tonnage is the entire enclosed volume of a ship, measured in register tons of 100 cubic feet (2.83 cubic meters). Net tonnage is the space that can actually be used for cargo, also measured in register tons. Logisticians prefer the measurement ton, which is equal to 40 cubic feet (1.13 cubic meters) of cargo or cargo space. The capacity of a ship in measurement tons is very roughly equal to its gross register tonnage. A ship can be loaded with only so much weight of cargo before it sits dangerously low in the water. A cargo ship has a deadweight tonnage defined as the maximum permissible weight of ship's gear, supply, and personnel, as well as cargo, measured in long tons of 2240 pounds (1.016 metric tons). The deadweight effective lift of a ship is the maximum cargo weight and is typically about 80% of deadweight tonnage. Neither of these measures corresponds very closely with the standard displacement used to rate a warship, which is its actual, physical weight when loaded for combat, measured in long tons. In practice, for typical military cargoes, it is volume rather than weight that limits carrying capacity. For planning purposes, the U.S. Army adopted a figure of 2.56 measurement tons per long ton of average military cargo and 1.44 measurement tons per long ton of Lend-Lease cargo. An unusually compact cargo, such as oil in 55-gallon (208-liter) drums, might take 1.37 measurement tons per long ton. A Liberty ship had a deadweight tonnage of about 10,800 tons, corresponding to a lift of about 8640 tons. Its cargo capacity by volume was about 12,506 measurement tons, for a ratio of 1.45 measurement tons per long ton. This demonstrates that only the most compact cargoes would be weight-limited, and only by a very small margin. However, ordinary merchant ships tended to have a greater measurement tonnage to lift tonnage ratio: 1.84 for a C-3 standard cargo vessel. Cargo ships in convoy could typically advance about 240 nautical miles (450 km) a day at sea. A cargo ship sometimes took as long to load and unload as it spent at sea, as the longer routes to the far Pacific ended at inadequate ports with long unloading times. Cargo was loaded using cranes and cargo nets, which in developed ports were loaded from trucks or rail cars. In primitive anchorages, cargo had to be loaded onto lighters (barges or landing craft) that could put to shore, where the cargo was manhandled off the lighters. As can be imagined, this was a time-consuming and labor-intensive process. Much of the development of landing ships was directed towards the problem of unloading cargoes quickly in the complete absence of port facilities, and the TO&E of Marine divisions included a pioneer battalion specifically to manhandle cargo ashore. 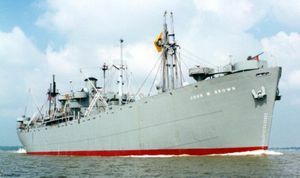 The U.S. Navy classified attack cargo ships separately from cargo ships, due to their special layout of cargo space and davits for landing craft.